How do you consolidate multiple operating companies on Office 365? Mark Read became CEO of WPP Group – the world’s largest creative, communications, content and technology company – in September 2018. WPP Group takes nearly $72bn in billings from many of the world’s most recognised brands, including Coca-Cola, Ford and Shell. At the heart of Read’s new strategy for the Group is a recognition that many of WPP’s customers will have needs that different WPP operating companies can meet. In order for WPP to meet customer demands seamlessly, Read has initiated a consolidation programme, to bring together WPP’s 350 operating companies. With a wide range of technologies in use throughout WPP Group, part of the consolidation programme will deliver a standard set of workplace tools, so that technology is used more consistently. This will empower WPP employees to create, share and communicate with one another easily, when working to deliver world-class projects for their customers. In November 2018 Read announced the consolidation of J. Walter Thompson, the world’s oldest advertising agency, with digital network Wunderman, to become Wunderman Thompson. This new super-agency brings together creativity, data and technology, employing 25,000 people across 200 locations and 90 global markets. Wunderman Thompson have set out to establish a new global gold standard, delivering their technology consolidation in months, where the norm for a 25,000 person organisation with multiple operating companies is often set in years. At the same time, WPP Group would have a proven technology platform and rapid integration approach, to manage their global consolidation. WPP Group have long been invested in the Office 365 platform. It was therefore an obvious choice on which to base Wunderman Thompson’s new digital workplace experience. SharePoint’s new Modern experience will provide Wunderman Thompson with publishing capabilities. Yammer will provide Wunderman Thompson with an employee engagement network, where all levels of the organisation can broadcast, comment, feedback and give praise to one another. Microsoft Teams will be the home of productivity, with guest access providing the perfect shared workspace for customer project work. OneDrive will empower employees with the ability to co-author, share and manage document versions. Wunderman Thompson have also selected AddIn365’s products and services to boost Office 365’s native capabilities and help Wunderman Thompson employees to adopt these new ways of working. AddIn365 Intranet optimises SharePoint Modern with AI capabilities designed to deliver content relevance, in a global company. AddIn365 Work Hub brings together Yammer, Microsoft Teams and OneDrive in to a fully personalised dashboard. AddIn365 Work Hub leverages bot capabilities to help employees work within Microsoft Teams. AddIn365 Analytics helps Wunderman Thompson to measure the adoption and engagement with the new digital workplace. 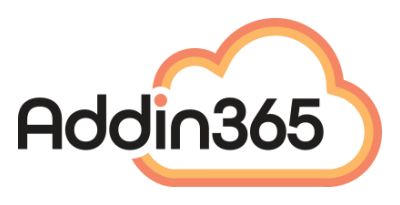 AddIn365’s services will help Wunderman Thompson to define and deliver the new digital workplace, as well as evolve employee working habits from email and file share to Microsoft Teams and OneDrive.